Are you new to nature photography? Feeling a little unsure of how to get started in your quest to make great images? If you want to consistently make good photos, there is a lot to learn. Fortunately, there are a tremendous number of resources out there to help you, but these can also be overwhelming to sort through. Here is an overview of the topics you will need to learn about from a nature perspective, and some guidance on the different resources available. Let me start with a very basic statement. There is a difference between making a photo and taking a snapshot. Maybe it’s because most of us have had access to a camera for taking family snapshots since we were young, that it can take a while before that realization and transformation occurs (and sometimes it never does!). Making good photos is a “whole brain” experience. A technically perfect image can still be unappealing if the artistic part is overlooked. But to achieve your vision you need to know how to make the tools work. And it takes time to thoughtfully put all of it together to make the photo. Simply pointing and clicking will rarely get you there. In selecting a camera, first define what you want to do with it. Nature is a broad genre and different subjects may require different equipment. There is bird and wildlife photography, macro photography and landscape photography. I recommend digital slr that you can interchange lenses on. A DSLR (digital single lens reflex) camera with interchangeable lenses will give you versatility and the ability to grow and upgrade over time. Here are some features to consider when comparing DSLR cameras. Sensor size or “Crop factor” (field of view multiplier): DSLRs have physically different sized sensors. Sensors smaller than one frame of 35mm film have a multiplying effect on the focal length of a lens. On a camera with a 1.6 field of view multiplier, a 100mm lens would be equivalent to 160mm. For landscapes, where short focal lengths are used frequently, less magnification is desired. For birds and wildlife, greater magnification will extend the focal length of your lenses. Frame rate: This is how many frames per second the camera is capable of exposing. This is useful for action but not important for still subjects. The buffer size in a DSLR is how many images are stored in the temporary memory before being written to the card. Generally this goes along with frame rate; the faster you can shoot, the bigger the buffer you need. 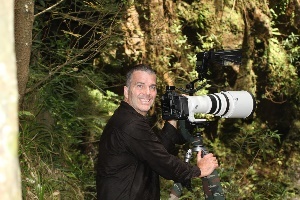 There are a wide variety of lenses out there and it can be very confusing for the new nature photographer. Do I need a zoom lens? So I need a fixed focal length prime lens? Do I need the professional lenses that have pretty hefty price tags? Just remember that there is no one lens that will fit every shooting situation. I quite often recommend to my students that they start with a good quality zoom lens until they figure out what type of photography they will be doing most of. Of course, budget considerations will play a large role here as well. A sturdy tripod is a necessity for the serious nature photographer. You will also need a tripod for macro and landscape photography as you need the stability for fine-tuning compositions, as well as for longer exposure times. For wildlife and birds, you need the support for the weight and size of the lens to achieve consistently nice sharp images. Try to get a tripod that is capable of going low to the ground, preferable one that has no center column and no supports between legs that limit this ability. Ball heads are generally preferred for shorter lenses and gimbal-type mounts, such as the Wimberley head, are generally preferred for super-telephotos. 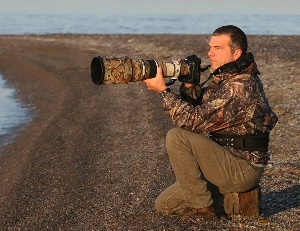 There are times for handholding, such as when shooting from a moving vehicle such as a Zodiac boat or for flight shots and action shots of birds and other animals. For handholding, a good general rule of thumb is to keep shutter speeds faster than 1/lens of the focal length. For example, with a 200mm lens, shoot faster than 1/200 second. With vibration reduction (VR) / image stabilization (IS) technology you can go a couple stops slower than this. To achieve best sharpness, support the lens with your left hand under the barrel, tuck in your elbows, hold your breath and squeeze the shutter gently using the muscles in your finger and not those in your arms or shoulders. The need for flash, and type of flash, will depend a lot on what and where you are shooting as well as under what type of lighting conditions. Flash is not typically used for scenic photography or many wildlife subjects. Most bird and wildlife photographers carry a flash along with a “Better Beamer” Flash Extender to increase the reach of the flash. For macro work, there are specialty flashes and flash brackets that are used to get light into very small, close objects. The common pop up flash on consumer and pro- sumer camera bodies have gotten better over the years but in my opinion still do not do the job that a good quality external flash can do.